National nonprofit, Bunker Labs, helps veterans start their next project, build a business or expand their networks to find their next career. Senior veterans are benefiting from this program as many of them are able to launch second careers and stay in the workforce longer. Veterans transitioning from the military to civilian life now have access to a network of local entrepreneurs to help support them during that transition phase. Standing united, business leaders, volunteers and veterans help empower veterans who want to start their own business after leaving the military. April is Financial Capability Month and Bunker Labs is a great example of an innovative ecosystem and community working together to help provide more opportunities for seniors and veterans. America is in a bit of financial trouble as seniors are beginning to retire; many of whom are in their early 60s, have not saved big enough nest eggs and could possibly live decades longer draining government resources. Economists refer to the issue as the ‘Silver Tsunami’ as more than 20 percent of America’s population will be retired, flooding the already struggling U.S. healthcare system. The longer Americans can work and find enjoyment and pride in their work the American economy as a whole is in better shape. Being an entrepreneur is a natural fit for many veterans and their skillset. Typically, the hours go beyond the typical ‘nine-to-five’ business day and leadership, problem-solving and perseverance – skills that are all learned in the military. Perhaps this is why it’s not uncommon for senior veterans to be business owners. Basically, Bunker Labs helps veterans network and connects them with resources, educational classes and other tools they need to help prepare them and give them confidence to succeed as small business owners. “We host expert roundtables and a series of evening classes to walk newly returned veterans through the startup process, including pitching to investors. There are also monthly ‘bunker brews’ for networking and socializing,” discusses Tozier. 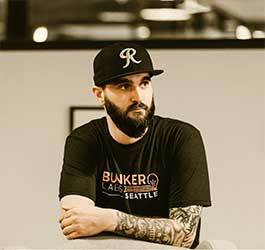 Bunker Labs is also partnering with WeWork to provide a Veterans in Residence (ViR) program, or a “fully sponsored workspace to ten tribes of ten veteran leaders across ten cities every six months.” Veterans and military spouses are also eligible to apply to be part of this helpful program which is opening doors for veterans and their families. Many veterans gathered at the Veterans in Residence Launch party a couple weeks ago at the WeWork South Lake Union location to celebrate. A couple of them discuss how they have successfully launched second careers and are very fulfilled in their entrepreneurial roles. Steven and Brenda are just a couple of the many veterans who can benefit from entrepreneurial veteran’s benefits. King County is home to at least 127,000 current and former members of the U.S. military, Army Reserves, and the National Guard of varying races, ages, genders and interests. While the pervasive idea that most veterans battle PTSD or addiction, Bunker Labs and WeWork seeks to replace that narrative with one that depicts veterans as highly-skilled leaders. The senior veteran demographic is benefiting from the business education, network and resources. In fact, helping veterans succeed in their own business pursuits is a veteran benefit with a spin. Bunker Labs empowers, teaches and supports veterans to reach their individual small business goals at any age. The WeWork partnership provides a space for veterans to turn their goals into a reality. As Jake Tozier relays, “We’re helping people not only find their way in the world after transitioning from the field, we’re also helping them feel proud to be veterans.” A worthy cause, we have to agree, as people are working well into their 70s in the 21st century. Your financial future matters. Start planning today. Bunker Labs works to inspire, educate, and connect veterans with the right people and the right resources to be successful as entrepreneurs and as innovators. Additionally, our online platform, Bunker in a Box, gives active duty and veterans worldwide access to entrepreneurship education, complete with dozens of interviews with military veterans who have successfully started a diverse array of businesses. WeWork’s ViR program is a national partnership with Bunker Labs to help veterans start their next project, build a business, or expand their networks and find their next career. WeWork provides fully sponsored workspace to 10 tribes of 10 veteran leaders across 10 cities every six months, and veterans and military spouses are eligible to apply. Bunker Labs provides the network, knowledge, and the resources to help those veterans and military spouses succeed as small business owners.